Block 518 is no ordinary location. It’s full of possibilities. We offer brand-new, state-of-the-art commercial, residential, retail and public space. Work time, play time, your time… you can find it at Block 518. Construction is currently underway and space is available for lease. Please contact 507-469-0887 for more information. 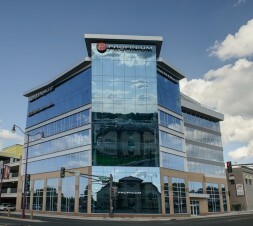 Currently under construction, Profinium Place is a seven story office building which consists of 75,000 square feet of Class A office space conveniently located in the heart of downtown Mankato and easily accessible off of Riverfront Drive. Currently under construction, Cherry Street Tower is a 50,000 square foot office building and is the newest addition to Block 518 at the intersections of Riverfront Drive and Cherry Street. 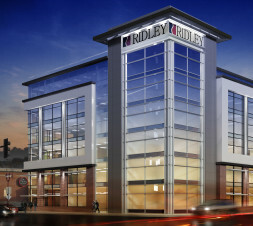 This Class A office space will be the new headquarters to the Mankato based Ridley, Inc. 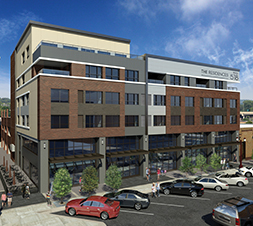 Currently under construction, this 40,000 square foot mixed-use facility consists of both upscale residential lofts, office space and retail space.